How could confusion arise as wisdom? According to the Mahamudra view, confusion arises as wisdom when we realize that everything we experience is the radiance of the mind’s own nature. And what is the nature of our mind? And how do we come to recognize that? These are the questions Gampopa answers for his students in the text commented upon here, known as the Great Community Talks. He shows them—and now us—the path of deep understanding and meditation that leads to the realization of Mahamudra, the “Great Seal” of the true nature of reality. Gampopa was a twelfth-century Buddhist monk who was a disciple of Tibet’s greatest yogi, Milarepa. He applied Milarepa’s instructions on meditation to reach the highest realization of Mahamudra. In this volume of advanced teachings, Gampopa passes on these same instructions in the form of heart advice on how to practice the nature of mind and reach enlightenment. Ringu Tulku’s commentary on the text, taken from his own community talks to students in Europe and America, makes Gampopa’s teaching wonderfully accessible. 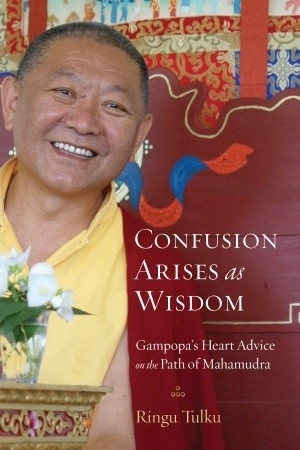 His gentleness, warmth, and humor, as well as his wisdom and practicality, shine through in his own heartfelt advice on how we too could transform confusion into wisdom.